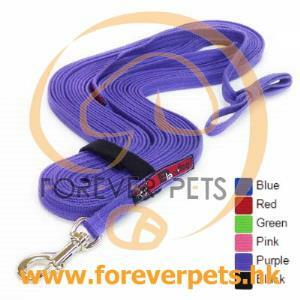 Black Dog Tracking Leads - Small size - 11 Meters long, 19mm webbing with Small Snap Hook. Black Dog Tracking Leads - Small size - 11 Meters long, Small Snap Hook. Supplied with Tap Handle end which can be undone to reveal a conventional loop handle end, if you prefer this style lead end. Standard length of a Tracking Lead is 10 meters, we give you the extra length to accommodate some people's preference to tie knots at set lengths along their lead. Made in 19mm webbing and designed to fold neatly, with a securing loop to hold it together and stop it getting all tangled when not in use.